Reserved until April 29 ? 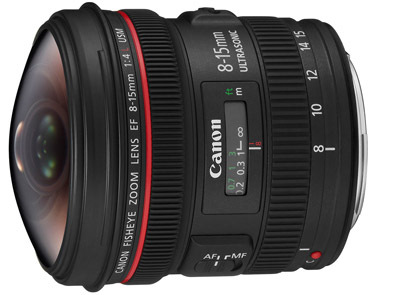 The Canon EF 8-15mm f/4L Fisheye USM is a super sharp and crazy wide “L” series fisheye lens designed for both full frame sensor cameras, such as the Canon 5D Mark III, and crop frame sensor cameras, such as the Canon 7D Mark II. On a full frame camera you will get a fully circular image at 8mm but a more traditional full frame image at 15mm. If you are shooting with a crop body, the lens barrel has markings for APS-C/APS-H sensors showing which focal length to use in order to avoid vignetting. This lens is built like a tank and is dust and moisture resistant. It also features ultra low dispersion elements, a Sub-wavelength coating to reduce ghosting, and a fluorine coating (also found in Canon's super-tele) to prevent fingerprints and smudging on the exposed elements. This lens is ideal for fine art photography, street photography, urban settings, wide expanses, and parties. • This fisheye accepts rear gelatin filters and not front screw-on type filters. • This lens is compatible with both full frame and crop frame sensor cameras and should not vignette so long as you abide by the APS-C/APS-H barrel markings on the lens.